► CANADA: Shell Oil awards CHC Canada chopper contract for sub-Saharan African oil rig ops. Shell International Exploration and Production B.V. has selected CHC Helicopter, a Canadian offshore helicopter services provider, for a five-year, multi-million dollar contract to support Shell's deep-water exploration activities off the coast of Sub-Saharan Africa. ► KENYA: DAC Aviation set to deploy six new Cessna Grand Caravan EXs to Nairobi Wilson for aid ops. DAC Aviation International (DAC), a provider of aircraft charter and maintenance, repair and overhaul (MRO) services with expertise in serving aid and relief agencies in remote and conflict-affected areas, today announced the delivery of a new Cessna Grand Caravan EX (s/n: 208B5013). This aircraft is the first of six Grand Caravan EXs to be delivered to DAC by Cessna over the next six months and will be ferried to Nairobi Wilson later this month. ► CENTRAL AFRICAN REPUBLIC: World's last operational BAe Andover gets a new lease on life in the CAR (of all places). Canada's West Wind Aviation (WEW) is set to take delivery of the world's last known operational BAe HS.780 Andover (SET 13 | TL-AEW) with the aircraft already reregistered in the Central African Republic. 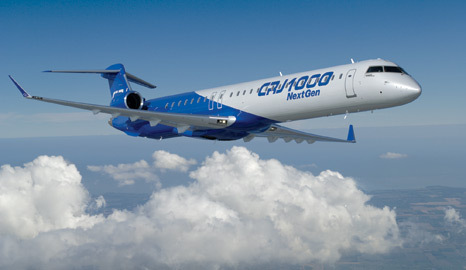 ■ TANZANIA: Now Canada's AvMax Aircraft Leasing wants their pound of Fastjet flesh. AvMax Aircraft Leasing has joined the growing list of disgruntled suppliers demanding their money from Fastjet (FN). The Canada-based ACMI firm recently wrote to Fastjet stating it had moved to deregister three of its aircraft previously leased to Fastjet's predecessor, Fly540 Tanzania, over USD2million worth of unpaid leasing and maintenance bills. ► CANADA: Egyptair to start Toronto flights from June. Egyptair (MS) will from 2 June 2013 introduce a 4x weekly Cairo – Toronto service on board Boeing 777-300ER aircraft. The Star Alliance member previously planned to launch Toronto service in 2011, but postponed it due to political instability in January 2011. ■ CANADA: South African Airways, Air Canada sign code share deal. South African Airways (SA) has signed a reciprocal code-share agreement with fellow Star Alliance member, Air Canada (AC), effective 13 December 2012.